Mother’s Day San Carlos, Mexico. In 2019. 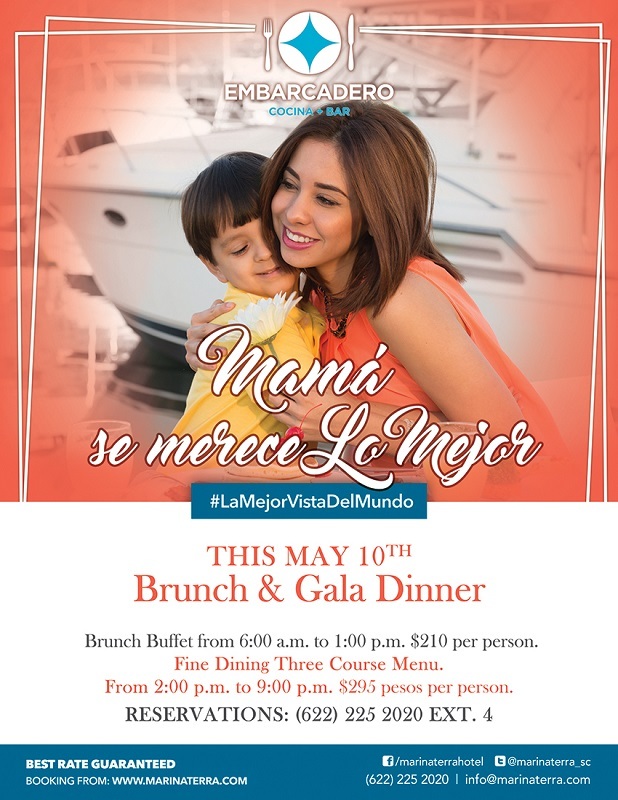 Mexico celebrates Mother’s Day on Friday, May 10. Canada and the US celebrate Mother’s Day on Sunday, May 12. 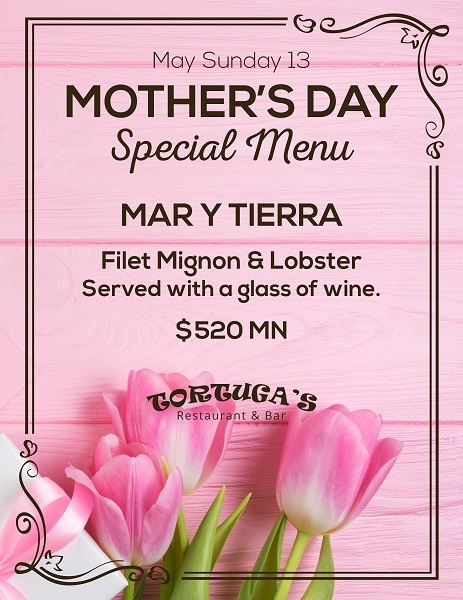 Pamper your mother with special menus, drinks and entertainment. On Thursday, May 10, treat mom to Brunch and a Gala Dinner at Embarcadero Cocina + Bar. From 6:00am to 1:00pm, Embarcadero will be serving a special brunch buffet for 210 pesos per person. A three course Gala Dinner will be served from 2:00pm to 9:00pm for 295 pesos per person. For reservations, call 225-2020 ext 4. 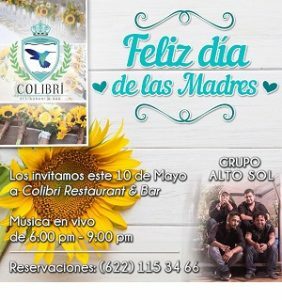 Join us at Colibri’s to celebrate a special day for the most important person in the whole world, our “Mother”. Open menu will be available but we’ll also have a special breakfast and dinner. Please make your reservation at 622-115-3466. 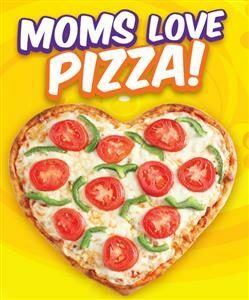 On Thursday, May 10, Froggy’s Bar is throwing a pizza party for mom with 2 for 1 pizzas, 30 peso margaritas and live music with the Dueto Amanecer from 7:00pm to 10:00pm. 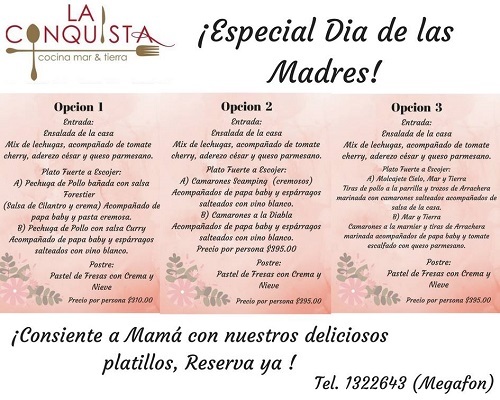 On Thursday, May 10, select any one of the special 3-course meals for Mother’s Day at La Conquista Cocina Mar y Tierra. Choose from a delicious Chicken, Shrimp, or Surf & Turf meal. Each comes with a mixed salad, sides, and dessert. See flyer on left for details. Call 622-132-2643 today for your reservation. Mom’s eat free this Thursday, May 10 for Mother’s Day at La Bartina 64. Some restrictions apply, so call the restaurant for details and to make your reservation. 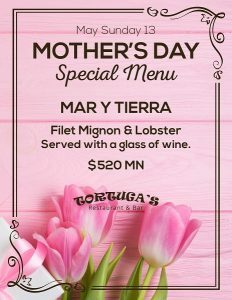 On Sunday, May 13, dine on Tortuga’s Mar y Tierra Mother’s Day special of Filet mignon and lobster served with a glass of wine. Cost: 520 pesos per person. All regular menu items will also be available. 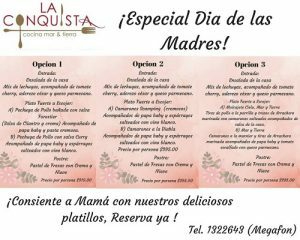 Call for your reservation: 622-226-2051.